Last year I sent out a questionnaire to several travel bloggers I know who wrote about or lived in Spain. I asked them to compile a list of the top must-see attractions in the country. With a country as large and diverse as Spain, this was a very difficult task, but I have finally compiled the results. This list is by no means definitive. It is intended to be a starting point for a discussion of the great places in Spain. With that, I present to you The Seven Wonders of Spain! One of the most significant chapters in the history of Spain was the Moorish conquest. From roughly the 8th to the 15th Century, Moors controlled various parts of Spain and introduced elements of Arab and Islamic culture. One of the most significant examples of Moorish architecture remaining in Spain is the palace/fortress of Alhambra in Granada. Used as the seat of government for the emirs of Granada, it was also used by Spanish rules after the Reconquista in 1492. It has been used as the model for many examples of Moorish revival architecture around the world. Not only is the Sagrada Familia the most iconic image of Barcelona, it might very well be the most iconic image in all of Spain. 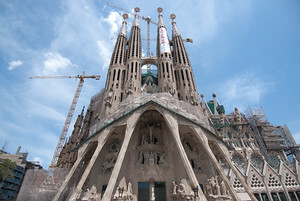 Designed by Catalonia architect Antoni Gaudí, construction of the church began in 1882 and is still continuing today. While the construction passed the midway point in 2010, taking 128 years to reach the point, completion is expected as early as 2026, thanks to modern advancements in construction. Construction is not funded from government or church sources. It comes completely from entrance fees and donations. It was dedicated as a basilica by Pope Benedict in 2010. If there is one entry on this list which stands apart from the others, it is the City of Arts and Sciences. It is by far the most modern place on the list and it stands apart from the other entries like it does in the city of Valencia. 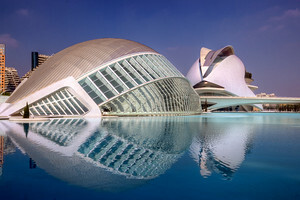 The City of Arts and Sciences sits in the former bed of the river Turia which used to flow through Valencia. After the river was diverted because of flooding, the land was appropriated to various uses including parks and walkways. Once a section was devoted to a collection of buildings dedicated to the arts and science. Designed by Valencian architect Santiago Calatrava, the site includes an opera house, a planetarium, a science museum, and an aquarium. The facility opened in 1998 and is personally my favorite place in Spain. Mount Teide is the highest point in Spain and lies in the center of the island of Tenerife in the Canary Islands. In addition to being the highest point in Spain, it is also the third highest mountain in the world as measured from base to peak, following only Mauna Kea and Mauna Loa in Hawaii. Teide is an active volcano who’s last eruption occurred in 1909. The area around the summit is a National Park and UNESCO World Heritage site. 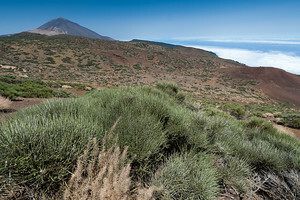 It is home to over 33 endemic species of plants, including the Canary Island Pine, and 70 endemic species of animals. The cathedral of Santiago de Compostela is believed to be the resting place of St. James the Apostle. It is also the destination for what is perhaps the greatest European pilgrimage route. All over Europe, you can see scallop shells in churches which mark the route of the Camino de Santiago (The Way of St. James). I have personally seen the symbol on churches as far north as Belgium and as far east as Prague. The routes and the cathedral constitute a three UNESCO World Heritage sites. Hiking the route to the Santiago de Compostela Cathedral has exploded in popularity over the last several years, increasing from just 690 pilgrims in 1985 to over a 270,000 in 2010. Before Spain was Spain, it was the Roman province of Iberia. The Roman presence here lasted hundreds of years and saw many famous leaders from antiquity pass through the region. Perhaps the greatest remaining Roman ruin in Spain is the aqueduct in the city of Segovia. Created in the 1st or 2nd century, the aqueduct was created to transport water from the Fuente Fría river to Segovia, a distance of over 17 km (11 mi). It is perhaps the great example of Roman water engineering still in existence in the world today. The aqueduct was used to carry water to Segovia until the 20th Century, which is a testament to the abilities of the Roman engineers. I often think of the Cathedral/Mosque of Cordoba to be the opposite of the great Hagia Sophia in Istanbul. Where the Hagia Sophia was a Christian church converted to a mosque, in Cordoba it was a Muslim mosque converted to a church. Originally built in the 7th Century as a Visigoth church, the building was converted to a mosque was expanded over several hundred years. After the fall of Cordoba in 1236, the building was converted back to a Christian church, which it has been used as ever since. During its period as a Mosque, it was the center of Islamic religious life in Moorish Andalusia. Today it still remains the Roman Catholic cathedral for Cordoba. This is a great list! I absolutely love the City of Arts and Sciences in Valencia. It’s so beautiful in photos and even more captivating in person. Plus, walking through the old Turia riverbed to get there is an adventure in itself. Valencia will always hold a special place in my heart. Beautiful art work. I would love to visit Spain ! Spain is definately one of my favorite countries. I love especially Andalucia with its moorish culture. A really nice place to stay at the coast of Andalucia is a village called Nerja. Check it out! Great Spain photos! The City of Arts and Sciences is amazing! I wish I was there to shoot more photos of it at night. My favorite cathedral is Sagrada Familia, but then I’m a big Gaudi fan. Glad to read the update about it’s completion in 2026. Should I make my airline reservation now? Love the site. I not long ago wrote an article about Barcelona. The City is amazing and has much to offer. Totally digging these, especially the Santiago de Compostela Cathedral. I’d add the Mezquita in Cordoba. A true architectural marvel! Great list! Few people travel to Spain to visit Córdoba and Granada. They don`t know what they’re missing! They’re wonderful!! Great list. I’m heading to Spain in a few weeks to walk el Camino de Santiago for a month and then look around for a month. This will definitely come in handy. I love Spain. It is such an awesome place to visit. I especially love the Basque region around San Sebastian. It is fantastic there. Wonderful post and gorgeous photos. Spain is high on my list when I backpack Europe. Now back to saving money to make that dream come true. Great, diverse list. Happy To have visited each one! Very nice list! I loved the Gaudi works in Barcelona! I need to return to Spain at some point to see more of the country. I only got to visit Barcelona & Ibiza. Awesome post, lived in Andalucia for 18 months, got to add the lakes at Ardales, dubbed “The Spanish Riviera” – beautiful! Gary, this is a very complete list with both landscapes and monuments -from North to South. You have been to many places in Spain already and you have been given very good advice. Next time you are here you need to see Menorca and Costa Brava. Steer clear of the Costa Brava beaches and head to the calas (Catalan for small beaches) they are another world and in my opinion some of Spain’s best “architecture”. A visit to the calas in Menorca will change your life. I was actually in Costa Brava for 2 days last year. Lovely pictures. Spain has never really appealed to me. I just associate it with package holidays. My dad loves it though and I would love the chance to go to Barcelona one day. Really great picks! I have yet to visit Spain but it is high on my list. Will definitely spend a while there next time I head to Europe. awesome Spain. I have never been here but with this post, I would love to visit Spain one day and do my own travel blog and photography. Ooh I need to see so much more of this beautiful country! another wonderful article..i’ve been to some of these sights..i love spain! i wish i could travel often like you Gary..happy trip always and be safe!